The wife of the Oyo State governor, Mrs Florence Ajimobi, who was allegedly arrested by London Metropolitan Police for money laundry, described the report as a rumour sponsored by people playing dirty politics. 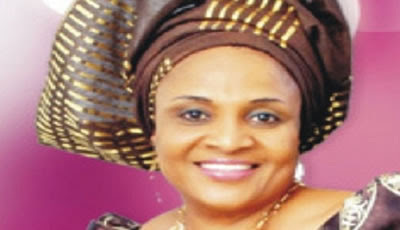 P.M.NEWS had reported on October 30, 2012 that the Met confirmed to them the arrest of Mrs. Ajimobi in London, with the sum of 400,000 pounds and thousands of US dollars, valued at N500million. However, during a telephone conversation with the First lady, she asid she was in London to take her 13 years old daughter to school. Mrs Ajimobi: Good evening. How are you? Comments have also revealed that the elegant first lady has, since asumption of office, travelled abroad 52 times in 17 months. Imagine that the money laundry and the numbers of travel are not correct, how will our educational system grow when the number one citizens of the state take their children abroad to school?